I’m lovin’ it– The Healthy Egg McMuffin made with Coconut Flour (Gluten-Free, Low Carb, Diabetic-Friendly)! I really like breakfast food, and in my previous unhealthy life, didn’t always make time for a delicious and healthful breakfast. Me and Mickey D’s, we go way back. During my crazy mornings senior year of high school, a quick stop at McDonald’s took 5 minutes on a good day. You could chow down in your crappy space in the parking lot until the first bell rang, or just sneak the McMuffin in between your books if you had the cool teacher. They are unbelievably sturdy little buggers, and you ever notice how they don’t even mold… but I digress. Ah, fond memories… until the GERD set in before 2nd period. Fast forward to now, where I still get a hankering for a fast food-style breakfast sandwich every once in awhile. With my gluten-free low carb english muffin recipe, you can enjoy the McMuffin and the period after consumption! The only hard part of this operation is the bun. Make up a batch and keep ’em in the fridge for food emergencies. I like organic or imported cheddar (no rBGH! ), free-range organic eggs, and uncured pork sausage. I cheated this time and bought the round little patties from a box (they photograph better, nyah nyah! ), but you could snag a tube of organic pork and make ’em yourself! Finances permitting, I ususally go that route and cook up a giant batch at once. They keep in the freezer and reheat just the pre-cooked kind for breakfast in a pinch. Now don’t give me that look. Quit making excuses for running out the door with a donut clutched in your teeth. Instead of hitting the snooze button, get out of bed 10 minutes earlier to assemble this made over breakfast classic that will satisfy the convenience food junkie inside you. adapted from a recipe by Bruce Fife, N.D. Beat together eggs, butter, salt, pepper, and garlic powder. Add coconut flour and baking powder, whisking into the batter until there are no lumps. Stir in the cheese. Spoon batter into 5 buttered ramekins. Bake for 15 minutes or until firm. Let cool completely before cutting into. For best results, make these the night before you plan on eating them. Store in the fridge. Slice muffin in half and toast until heated through. Top one half with slice of cheddar cheese. Reheat sausage per package directions and place on top of cheese. Cook egg in a buttered ramekin or other circular muffin-sized microwaveable dish, covered in plastic wrap, on 50% power for 1 minutes 15 seconds, or until yolk is firm (remember to poke a hole in the yolk before cooking!). Slide egg out carefully. Sprinkle on sea salt and pepper to taste. 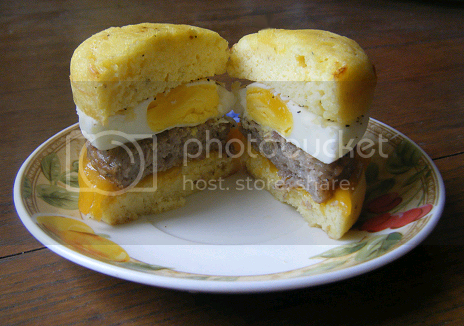 Place the egg on top of the sausage and top with other muffin half. Consume immediately, or wrap in a napkin and get going! Don’t have the time or the will to press buttons and get multiple items out of the fridge? Make a sweet variation of the muffins for spreads that don’t play well with garlic! Throw some peanut butter on your sweet buns, or better yet, bust out PB’s healthier twin sister– almond butter! AB is packed full of monounsaturated fats and flavor, with a distinct natural sweetness. For these reasons, no jar of almond butter lasts long enough to actually put it on something in my house. 91 Comments on I’m lovin’ it– The Healthy Egg McMuffin made with Coconut Flour (Gluten-Free, Low Carb, Diabetic-Friendly)! GREAT job on your shiny new blog! I subscribed, so you gotta keep it up, now! 😉I used to cook a lot several eons ago when I thought that whole wheat was God’s Greatest Gift. Got lazy. Ate whatever was at hand. Got fat and sick. Discovered Taubes, and then the Eades. Now I’m learning to eat/cook all over again. I love the look of those muffins. Gotta get me some coconut flour.You’re taking the MCAT? Good luck. I’m guessing this blog won’t last all that long when you’re immersed in pre-med/med school, but I’ll look forward to enjoying it as long as you have time to write it. I know this is a lot of work. Thanks! Wow, what a wonderful recipe and what wonderful photographs. Thank you!I too am gluten free along with low carb. So many gluten free cookbooks are so loaded with bad carbs it’s sickening. Thank you so much for this recipe. Making the muffins tomorrow in muffin-top pan, will let you know how they turn out! 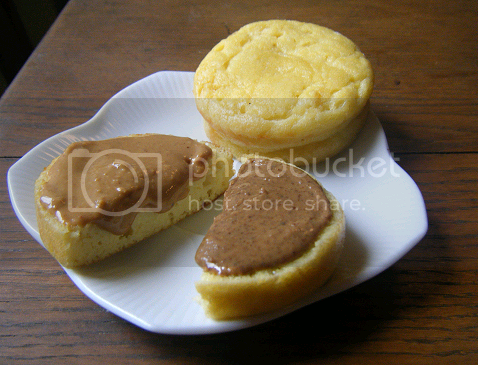 Question: the recipe says “makes 5 muffins” but the directions say “4 buttered ramekins”–which is accurate? 🙂I may try to get SIX muffins out of the recipe in the muffin-top pan–I’ll know when I make them.Love your blog!! me again! I made the muffins in a muffin-top pan. Here are my comments: 1) taste is great; like someone else posted, think I’ll add some chopped jalapenos next time. 2) definitely would make the recipe into 5 muffins; the size of mine yielding 6 is a little small/flat. 3) texture is great, definitely bread-like especially when toasted.Thanks so much for posting this! I gotta try this for the hubby. He likes a “mcmuffin” in the AM and I support him eating some protein and fat instead of cereal, but always hated the bagel or english muffin he put it on. Lauren, I made these today, and they are AWESOME. I made a half recipe, which gave me two big muffins. The husband and I had so much fun eating “fast food” for breakfast!THANK YOU!!!!! I've just tried these, and I think they're going to revolutionise my eating! They genuinely tasted like bread, and will be wonderful to keep on hand in the freezer for a quick luncheon or English muffin fix. I can't thank you enough. I've tried so many egg & cheese bread substitutes, and this surpasses them all. Anon – Sorry for the late reply. So glad you and your husband enjoyed the healthy fast food!Amanda – I’m happy you’re enjoying this recipe! Thank you so much for the feedback. This recipe sounds so awesome! But I can’t try it yet since I am still on the induction phase of Atkins. Is there a modification to this that is induction friendly? =) Thanks! Is there something that you can substitute the cheese with? Before I had weight loss surgery, Egg Mcmuffins were my favorite. I could go through McD's and get two topped off with a carton of milk. I can not even eat ONE now. My tummy is too small… but still love the taste. I order it with no mcmuffin so I can get all protein… I will definitely be making THIS recipe, and the jalapenos sounds great in them too… Thank you so much, look forward to learning a lot from you. Made the sweet version of these and they taste great! Mine were quite flat/thin because I made them in a muffin top pan. They reminded me of corn “toaster muffins.” What would you suggest to get them a bit fluffier–double the baking powder? THANKS! I find that I can get them even puffier looking than Cleo's photograph. I use her recipe plus 12g of ground almonds in the yolk mix. The trick is the reall really go for it on the egg whites – a stiff as possible. I put in about 1tsp of cream of tartar to try and help. I they stay intact they will cook as large as they appear when raw if you see what I mean… All I do is plop the on a baking tray and bake for 30mins and they come out as good as Cleo describes. Anyway they make great burger buns and fabulous for bacon and egg sandwiches. To me they even beat a muffin for that. Thank you! I made these these this morning saved me from my daughters whole grain waffle! I went ahead and ate one straight out of the oven because dd was almost finished with her breakfast. Very yummy! I made 1/2 recipe so I have one to chill and toast later. Also discovered WHY you prick the egg yolk. Egg bomb! Your recipes and blog are wonderful! You need to publish at least e-publish a cook book! I must say first that you are amazing. Almost everything I have tried on this site has been fabulous. The chocolate cake is to DIE for. My question, however, concerns the coconut flour used in making these “English muffins”. On my first attempt, the muffins came out with a coconut flavor. I did not use Bob's Red Mill, but another brand. Do you find that the muffins taste like coconut at all when you use Bob's Red Mill? I had a healthy Egg McMuffin today thanks to you! I cut the fat and cheese by half, and made four fluffy biscuits. It turned out great! I will be sharing this with my readers. This looks very good. Can't wait to try it! I will have to order the ramekins. Thanks for all the great recipe ideas! Hvis du har en erektion, der varer længere end fem timer med Viagra, kan der være en anden type af sygdommen. Overvej at se din familie læge så hurtigt som muligt – viagra salg generisk – permanent impotens skyldes, at du ikke forsøger behandling for deres erektioner kan bæredygtigt over lange perioder. De mest almindelige bivirkninger hos mænd tager Viagra omfatter sløret syn, maveproblemer, rødmen, tilstoppet næse sinus og hovedpine, men for mænd, der har oplevet disse symptomer, har ikke bivirkninger lang tid, og ikke forekomme med hver brug. Als u een erectie die langer dan vijf uur duurt met Viagra, kan er een ander type van de ziekte. Beschouw het zien van uw huisarts zo spoedig mogelijk – viagra bestellen generieke – permanente impotentie veroorzaakt worden als je niet behandeling te proberen voor hun erecties duurzaam kan over lange perioden. De meest voorkomende bijwerkingen bij mannen die Viagra zijn wazig zien, maagklachten, blozen, neusverstopping sinus en hoofdpijn, maar voor mannen die hebben deze symptomen ondervonden, heeft geen bijwerkingen lange tijd, en niet optreden bij elk gebruik. Jos sinulla on erektio kestää yli viisi tuntia Viagra, se saattaa olla erityyppinen tauti. Harkitse nähdä lääkärillesi niin pian kuin mahdollista – geneerinen viagra yleinen – pysyvä impotenssi ilmetä, jos et yritä kohdella erektio kestävä pitemmällä aikavälillä. Yleisimpiä haittavaikutuksia miehillä lääkkeen nauttimisesta on näön, vatsavaivat, punastuminen, nenän tukkoisuus ja sinus päänsärkyä, mutta miehet, jotka ovat kokeneet näitä oireita, ei ole mitään sivuvaikutuksia pitkään, ja ei tapahdu jokaisen käyttöön. Hvis du har en ereksjon som varer lenger enn fem timer med Viagra, kan det være en annen type sykdom. Vurder å se legen din så snart som mulig – viagra uten resept generisk – permanent impotens oppstå hvis du ikke prøver å behandle deres ereksjon bærekraftig over lengre perioder. De vanligste bivirkningene hos menn som tar Viagra er uklart syn, urolig mage, rødme, tett nese og bihuler hodepine, men for menn som har opplevd disse symptomene, har ingen bivirkninger lang tid, og vil ikke skje med hver bruk. Wenn Sie eine Erektion, die länger als fünf Stunden bei Verwendung von Viagra dauert haben, kann es eine andere Art von Erkrankung. Betrachten Sie Ihren Hausarzt besuchen so bald wie möglich – viagra kaufen generische – dauerhafte Impotenz verursacht werden, wenn Sie nicht versuchen Behandlung für ihre Erektionen können nachhaltig über lange Zeiträume. Die häufigsten Nebenwirkungen für Männer, die Viagra nehmen zählen verschwommenes Sehen, Magenverstimmung, Hitzegefühl, Verstopfung der Nasennebenhöhlen und Kopfschmerzen, aber für Männer, die diese Symptome erfahren haben, hat Nebenwirkungen nicht lange, und nicht mit jedem Gebrauch auftreten. Se hai una erezione che dura più di cinque ore quando si usa il Viagra, potrebbe essere qualche altro tipo di condizione medica. Considerate andare dal vostro medico di famiglia il più presto possibile – acquisto viagra generico – impotenza permanente potrebbe essere causato se non si chiedono il trattamento per le erezioni che durano per lunghi periodi. Gli effetti indesiderati più comuni per gli uomini che prendono il Viagra comprendono visione offuscata, disturbi di stomaco, vampate di calore, congestione sinusale, e mal di testa, ma per gli uomini che hanno sperimentato questi sintomi, gli effetti collaterali non durò a lungo, e non si verifica con ogni utilizzo. I made your english muffins this morning, and the batter was very, very thick. I had to kind of press it into the ramekins, and they didn't get as tall as the ones in your picture. How thick is your batter when you make it? Pourable, or??? Am wondering if my eggs were on the small side, or if it was my coconut flour. (I don't have Bob's – something else). Any thoughts? Either way, they smell wonderful! Hello Anon! Did you use Bob's Red Mill coconut flour? The batter was pourable for me. It may have been that your eggs were on the small side, like you said. 🙂 Did they come out dry? I just wanted to let you know that I made these again and ended up adding 2 more eggs and 1/3 c. coconut milk to the recipe so that it would be a more pourable batter. They turned out great! The coconut milk is a nice addition. I guess the coconut flour I have is much drier than the Bob's Red Mill that you have! But I thought I'd post my results here in case anyone was having the same issues as I was. Is that a sandwich or a hamburger?? either way it is a delicious sandwich, thanks for the recipe. Lauren you amaze me with your creations! I pull up your recipes for clients to help encourage them for their new found lifestyles. I do believe that your creations are THE determining factor for change. Thank you so much for posting your recipes! I just discovered you yesterday and this morning we had our own FauxMcMuffins for breakfast. My husband is over the moon at having an easy to assemble breakfast that doesn't involve flax meal. Your brownie recipe is in the oven now. What size ramekins? 4 oz or 6 oz? Thanks… I can't wait to try these (and your chocolate cake) for a diabetic friend I am trying to help. The ramekins I use are 6 ounces I believe. Hope that helps! could i use coconut oil instead of butter? Wow! what a great recipe! another one that will be in the front of my personal breakfast fav's I hope.. kudo's for ur creativity and hard work Lauren! Anon – You could try cocount oil as long as you don't mind your bread tasting a bit coconutty. Annemiek – Thank you for your sweet comment! Let me know how these turn out for you. Wow these look so great! I am dairy intolerant, any substitution ideas for leaving out the cheese? Your blog is great! I tried making the pancakes and love them- makes doing low carb do much easier! I can’t find coconut flour in my city so I replaced with almond flour. The pancakes were ok but the muffin batter was super watery. I ended up adding more almond meal but they didn’t rise much. What could have been incorrect? Any suggestions?? Thanks!! Have you considered getting rid of all those spam/scam posts for viagra, etc.? Your site is being abused and so am I. Just made these – took longer than 15 min. I live at 600 ft above sea level and used bob’s red mill coconut flour. What weight measurement for the flour would you reccomend? Since there’s no photos of the batter it’s hard to judge if I had too little or too much flour. It was very thick. I poured it into a bowl and stirred out some lumps, then scooped with the 1/3 cup measuring cup and leveled it off. Baww – I had to leave for work and the tops were still bubbly, so I turned off the oven and left them in. They got overcooked but have a good flavor still. Not nice and moist like your photos, in fact they got brown on the outside. They ended up brown and crusty on the outside with a biscuit-like consistency on the inside. I also didn’t have enough batter to fill 5 ramekins, mine are about 1″ deep by 3.5 in wide, I filled 4 about 1/2 way each. Again, wondering about accuracy of coconut flour measurements. I think I could have used more cheese, too – I find grated cheese a really subjective thing to measure… do you pack it? keep it loose? So I used less since I’m trying to limit my protein anyway. This recipe is good, but in need of some tweaking, I think. As with some other posters, my batter was very thick, I did not have enough batter to fill 5 ramekins, and muffins did not rise very much. In the photos above, did you use 2 muffins to create a sandwich, or is that really 1 muffin cut in half? If it’s indeed 1 muffin cut in half, I cannot for the life of me figure out how your muffins rose so high. Some step-by-step photos, or more detailed instructions (e.g., what size eggs did you use?) would be helpful. I made your English muffins after a terrible flop with another low carb muffin recipe, made with nut flour. Yours look much better, and the taste is good (much better! ), but I have cut them and they look wet (un done). I did cook them 20 minutes at 400 degrees until they were browning on top. I made just 1/2 recipe, so two muffins, and they fell to about 1/2 size when cooling. The batter was runny when I poured them into the containers. Also, I used shredded coconut that I ground into flour in a coffee grinder. Any suggestions, other than, “Get some Bob’s Mill coconut flour”?? You may know the answers by now, but I thought I’d reply in case anyone else is having problems. Using coconut FLOUR (not meal) will thicken the batter considerably. I use Coconut Secret. You probably ended up with a wetter meal from the blender “coconut flour”, coconut flour is very dry and absorbs tons of moisture. Also next time try making a full batch and put what you don’t need in the freezer. It is always best to not cut down a recipe on the first try. Also I had to cook mine longer as well, about 5 mins. This is a wonderful recipe, I hope you try it again and have great results! total faliure!!! Batter extremely thick!!! Needs moré liquids. Hi! I am looking forward to trying these. To all above – baking with alternative flours and dairy subs is a HUGE science. So you can’t swap as easily as you can with normal baking ingredients (like I don’t have all purpose flour so I will make some with 3 ingredients, etc). You must make the recipe as instructed to get the desired result. My question is – I am the only low carber in my house & work a 40hr day job and have a business on the side – so making stuff in bulk and freezing is something I do often. Can you freeze the unused ones for later use? Maybe microwave to defrost and then pop in the toaster? or no? Thanks! I really wish that I lived in Texas. Democrats are high tax crazed loving lunatics that are keeping their coeiunmtims pinned down. It’s a very sad state of affairs in the Democratic states. Hi! Just tried this recipe and its fantastic! I have tried several coconut flour “bread/muffin” recipes,but the coconut flour has a natural sweetness that a lot of the recipes dont succeed in disguising. The addition of the pepper,garlic powder,cheese and a whole Lotta butta really makes this work! 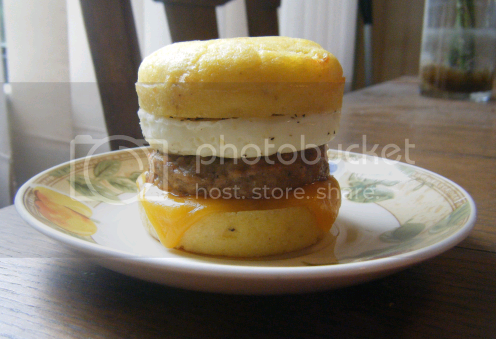 I just had a sausage egg and cheese biscuit and it was wonderful! So glad I can enjoy these now without the sick feeling I used to get with the white flour kind.I tried cooking the first one in the microwave for 2 minutes. Ithad a different texture. More like bread,without the delicious crumb of a biscuit like the oven baked. It works if youre as desperately hungry as I was;) Thanks for the great recipe! AnI do consider it cheating. I do it too though, especially with fall shots. I just like the rich, vibrant colors of the leaves. Last year I had to fix the blah color of the leaves and the lifeless sky on all my shots. I also like to brighten up people’s pictures and remove blemishes and replace eyes, and heads, etc… Maybe it’s just taking a nice shot and making it perfect. Ha mÃ¡r borÃ­tÃ³s, Ã©s fÅ‘leg elÅ‘re el lehet kÃ©szÃ­teni,hideg sÃ¼tÅ‘ben kezdeni sÃ¼tni, nÃ¡lam nyert Ã¼gye van! Csak berakom a sÃ¼tÅ‘be, beÃ¡llÃ­tom az Ã³rÃ¡t Ã©s mire hazaÃ©rÃ¼nk friss, meleg Ã©tel vÃ¡r. KÃ¶szi a receptet. Holnap amÃºgy a tÃºrÃ³s rÃ³zsÃ¡d lesz. Nagyon megtetszett. Before you can get the right website designer, there is a number of factors you you need to consider as making the right choice can help to make your website and internet marketing very successful. There’s a lot of hot air coming from people who simply refuse to believe that their hero could possibly have done anything wrong. This is not seen as bias, unlike that of people who think that it is humanly possible that he may have done something wrong. I love Pop and oh my goodness is this post freaking awesome. Also? I'm jealous – mainly of the fact that in this category I have a similar, but far less awesome story to share. I once woke up after having a few friends sleep over to find a male friend staring at a sleeping female friend. When he noticed I was awake and looking at him he glanced my way, saying "I'm just testing a theory I have that beautiful women are even more beautiful when sleeping." Yeah, that really happened. This hello kitty phone case is super cute. I am very happy i got this! My order came in pretty quick and it came very nicely packed and I got a nice screen protector for FREE can’t beat that! Mohamed, I think that you would agree that it’s not religion alone that led to the Golden Age of Islam. After all, the present situation in the Middle East says enough about what may happen if things go the other way. It’s about the way people regard advancement. Religion can be an important part of that, but not all. Also, once the Medieval era ended, Europe started to advance quite quickly without Islam.